Chuck Dixon and Paul Rivoche took to the The Wall Street Journal this past weekend to address an issue that guys like myself, Hube at Collossus of Rhodey, and Avi Green over at The Four Color Media Monitor have been spotlighting for ages: moral relativism in the comics industry. Over the years, fewer and fewer superheroes had a functioning moral compass, and the result is that these days its often difficult for to distinguish between the hero and the villain. As the industry lurched to the left, conservative voices were elbowed out. The result: A politically correct schizophrenic comic book market, where creators see themselves as “social justice warriors,” one day, and writers with no social responsibility the next — usually when a cultural event turns the nation’s attention towards moral relativism practiced in much of the entertainment community. In the 1950s, the great publishers, including DC and what later become Marvel, created the Comics Code Authority, a guild regulator that issued rules such as: “Crimes shall never be presented in such a way as to create sympathy for the criminal.” The idea behind the CCA, which had a stamp of approval on the cover of all comics, was to protect the industry’s main audience—kids—from story lines that might glorify violent crime, drug use or other illicit behavior. In the 1970s, our first years in the trade, nobody really altered the superhero formula. The CCA did change its code to allow for “sympathetic depiction of criminal behavior . . . [and] corruption among public officials” but only “as long as it is portrayed as exceptional and the culprit is punished.” In other words, there were still good guys and bad guys. Nobody cared what an artist’s politics were if you could draw or write and hand work in on schedule. Comics were a brotherhood beyond politics. The 1990s brought a change. The industry weakened and eventually threw out the CCA, and editors began to resist hiring conservative artists. One of us, Chuck, expressed the opinion that a frank story line about AIDS was not right for comics marketed to children. His editors rejected the idea and asked him to apologize to colleagues for even expressing it. Soon enough, Chuck got less work. The superheroes also changed. Batman became dark and ambiguous, a kind of brooding monster. Superman became less patriotic, culminating in his decision to renounce his citizenship so he wouldn’t be seen as an extension of U.S. foreign policy. A new code, less explicit but far stronger, replaced the old: a code of political correctness and moral ambiguity. If you disagreed with mostly left-leaning editors, you stayed silent. 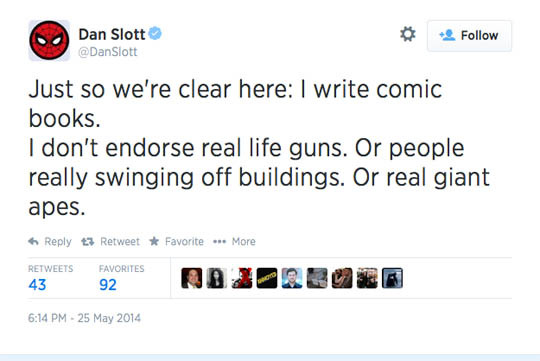 Perhaps the most recent glaring example of the industry’s moral relativism came from Marvel’s Spider-Man scribe, Dan Slott. Nrama: With Superior Spider-Man, you’re writing Doc Ock as a lead character for really the first time, and a more long-term Doc Ock story than has really been seen before. We’re seeing the character put in very different situations, interacting with totally different characters. What kind of task has that been — approaching his mindset and his attitude in the position of a lead character? Slott: He’s trying his best to be a hero, but he’s doing it in a very Doc Ock way. And Doc Ock’s an egotistical, annoying sh*t. It makes him an interesting character. At his core, he’s someone we don’t really think of heroic. But is he any more annoying than [former villain] Hawkeye used to be? Yes, that’s right. Dan Slott actually asked if a man who tried to incinerate 6 billion people was any more annoying than Hawkeye in his very early days as a villain. Slott: Also, when you look at Doc Ock, he was so much like Peter Parker. Peter Parker, if he didn’t know the lessons of power and responsibility, that teenage nerd would have grown up to be an Otto Octavius nerd, with the same kind of, “I’m going to make them pay.” This is the flip of that. This is Doc Ock getting to go back in time and be as young as Peter Parker, and have force-fed into him this sense of power and responsibility. He has that lesson from Uncle Ben in his core. That was Peter Parker’s parting gift to the world — I’m not going to leave the world a villain, I’m going to leave them a hero. So either Dan Slott was lying in his interview, or he forced Peter Parker to make one of the dumbest superhero decisions of all time. 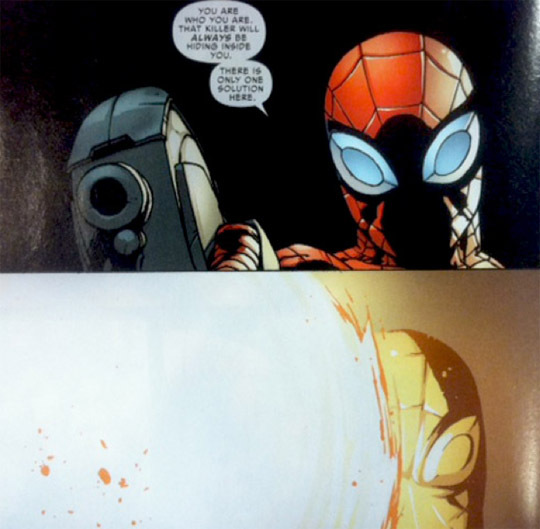 If Dan Slott’s “hero” had Uncle Ben’s lesson embedded in his core, Inception-style, why did he blow a guy’s face off at point blank range or engage in Nazi-like torture practices? Great “gift to the world,” Mr. Slott. The funny thing about moral relativists is that when the culture spins out of control they refuse to take any responsibility for the disgusting cultural mosaic they’ve helped to create. It’s always the fault of someone else. Dixon and Rivoche end their piece by saying that they “hope conservatives, free-marketeers and, yes, free-speech liberals” will join them in entering the field with a renewed sense of purpose. Conservatives may have an uphill battle when it comes to getting their work seen through traditional outlets, but modern technology has helped level the playing field. If you’re a conservative or libertarian writer with a story that’s been sitting in your head for years, get it out of there. Crack open your laptop or go old school with a typewriter. Do whatever it takes to get your story one step closer to reality. Start that snowball rolling downhill and see where it takes you. The same thing goes for artists and musicians. There’s an old saying that the greatest trick the devil ever played was convincing the world he didn’t exist. In a similar vein, the greatest trick moral relativists play is convincing people that what they read and listen to on a daily basis is incapable of warping their minds in dangerous ways. If you see yourself as a creative conservative or libertarian individual, you owe it to yourself and your community to share that gift with the world. The ideological battle may be a long tough slog, but it’s one that is worth fighting.